Madeira island offers some of the finest big game fishing grounds for Atlantic Blue Marlin. Fish close to and in excess of 1,000lbs are caught here more than anywhere else in the world. Madeira Island is one of the world's most popular destinations for big game fishing. Lying in the Atlantic Ocean nearly 1000 km (621 miles) from Lisbon, this verdant, sub-tropical jewel is lapped by the mild waters of the gulf stream and enjoys warm, comfortable summers and short, mild winters. This enviable climate makes it an enchanting and appealing all-year-round holiday destination. For sport fishermen, the conditions are ideal. The summer months, between May and October, bring with them an abundance of sleek shark, Atlantic blue marlin and other splendid billfish. In winter, from February through to late April, the cooler waters draw feisty bluefin and bigeye tuna, among other pelagic species. Actually, Madeira is ideally placed at the migratory route for large game fish, and the depths teem with sea life. Taking full advantage of this marine paradise is the Balancal, a private sport-fishing vessel. Moored at Funchal marina, it's available exclusively for residents and guests of Palheiro Estate. The powerful, twin-engine motor yacht is suitable for eight persons and has a fly bridge with covered helm position. An original Pompanette fighting chair all the way from Florida is positioned at the stern. A day out on the ocean in search of the "Big One" is an adrenaline-fuelled adventure. The steely-eyed Atlantic blue marlin is smart and swift, a cunning adversary and the ultimate catch for any angler. To land a fish like this takes skill, courage and a boatload of respect for one of Nature's most majestic and awe-inspiring creatures. Suitably, the Balancal operates a 'catch and release' policy. The Balancal can also be chartered for more leisurely pursuits like whale and dolphin watching, coastal cruises, swimming, and special excursions. The Madeira Island Fisheries have a rich but relatively short history. Fisheries were discovered some 30 years ago and visiting anglers have traditionally targeted blue marlin, bigeye tuna and shark. Dr. Antonio Ribeiro was supposedly the first person to catch a blue marlin off Madeira bringing ashore a fish of 740 pounds in 1973. His sons Roberto and Joe to this day religiously fish for blue marlin and carry on in their father's footsteps. 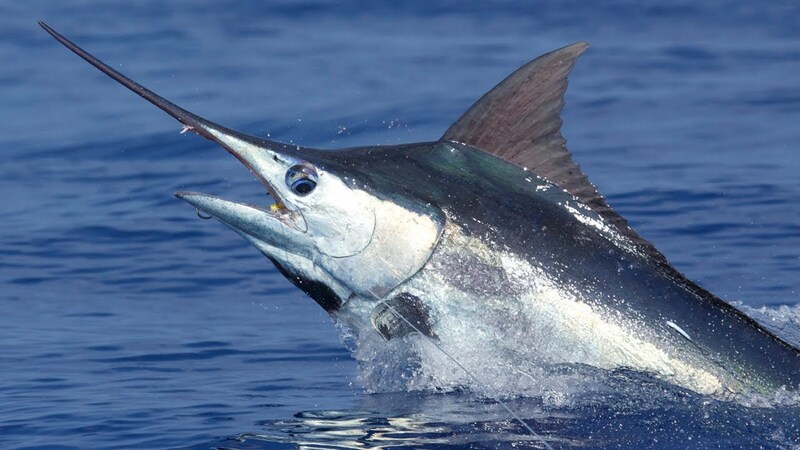 Madeira has over the past years produced some of the world's largest blue marlin, which is also reflected by the results of the annual July 4th Blue Marlin World Cup. Madeira was World Cup winner in 1995, 1996, 1997 and narrowly missed the World Cup fish in 2000. This year's result was a second place. The marlin season in Madeira runs from May through to October, with a fish average of about 700 lbs. About one in every ten is that fish of a lifetime, a grander blue marlin. These huge creatures swim in its predominantly calm blue waters, with the run to reach these leviathans being practically non-existent. In fact it is not uncommon to catch fish within 1 kilometre of leaving the marina! Add to this a delightful temperate climate in which to fish, and all of this set in a safe, civilised European environment you'll see why there is no finer Atlantic Blue marlin fishery. For these reasons some of the most famous names in fishing such as Stewart Campbell, Jerry Dunaway, James Roberts or Tracey Melton now regularly make their way to Madeira for the summers and those world record fish! As Madeira's warm blue waters change to a cooler green the fishing also undergoes a transformation. The marlin gradually leave, replaced by shoals of bigeye tuna and albacore. These pelagic migrants provide the angler with some truly world class tuna fishing from February to May. Bigeye tuna of 150 lbs+ are regularly caught with fish in excess of 200 lbs being far from uncommon. Albacore whilst not reaching the weights of the bigeye tuna do provide the angler with worthwhile sport on lighter tackle. Join us and catch the fish of your dreams with Balancal. Wahoo fishing Madeira? Wahoo up to 90lbs are not uncommon and make excellent sport on light tackle. This year for all of you fishing on Balancal and staying at Casa Velha we will cook your catch for you*. Our skilled Captain and crew will fillet the fish whilst our team of chefs at the Casa Velha will make sure you get the maximum flavour from your hard-earned prize of the Atlantic Ocean. *Bill fish are not included as we operate a release policy. Often caught and ideal for eating: "dourada" (gilthead bream), tuna, wahoo and blue fish. 1 day of deep sea fishing on M.Y. Balancal including crew, fishing equipment, picnic including beverages. 3 days of deep sea fishing on M.Y. Balancal including crew, fishing equipment, picnic including beverages.